London : Bloomsbury YA, 2018. Summary: Aelin Galathynius's journey from slave to assassin to queen reaches its heart-rending finale as war erupts across her world … She has risked everything to save her people – but at a tremendous cost. Locked in an iron coffin by the Queen of the Fae, Aelin must draw upon her fiery will to endure the months of torture inflicted upon her. The knowledge that yielding to Maeve will doom those she loves keeps her from breaking, but her resolve is unravelling with each passing day… With Aelin imprisoned, Aedion and Lysandra are the last line of defence keeping Terrasen from utter destruction. But even the many allies they've gathered to battle Erawan's hordes might not be enough to save the kingdom. Scattered throughout the continent and racing against time, Chaol, Manon, and Dorian must forge their own paths to meet their destinies. And across the sea Rowan hunts to find his captured wife and queen – before she is lost to him. 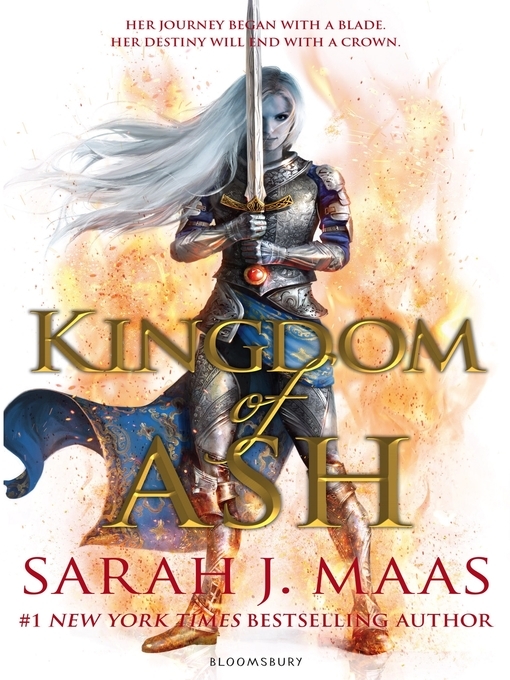 Some bonds will deepen and others be severed forever, but as the threads of fate weave together at last, all must fight if they are to find salvation – and a better world.Years in the making, Kingdom of Ash is the unforgettable conclusion to Sarah J. Maas's #1 New York Times bestselling Throne of Glass series. Requires OverDrive Read (file size: N/A KB) or Adobe Digital Editions (file size: 2787 KB) or Kobo app or compatible Kobo device (file size: N/A KB).